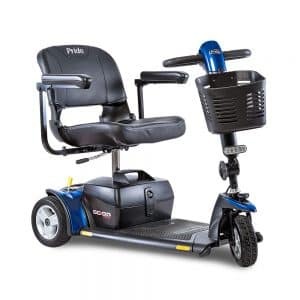 When it comes to mobility aids, Pride Mobility Products stands out as a global leader by adhering to the most strict quality controls and providing users with top technology and innovation. With this in mind, the scooter Pride Go-Go Sport is an outstanding and stable ride that reaches speeds of up to 4.7 mph. At Orthopedic Service Company, we pride ourselves in offering only the highest quality products the market has in store. This means that we only work with brands adjusting to our top standards, with Pride Mobility Products being one of them. As a mobility vehicle, the scooter Pride Go-Go Sport delivers high performance and convenience, making it travel ready from the get go. With feather touch disassembly systems, users can dismount their vehicle with only one hand, making it highly convenient for easy storage and transport. As mobility aid providers, we are proud to put our basis into customer satisfaction and safety. Part of what makes us good at our job is the way we guide you into making the best purchase decision possible. We consider your specific needs, lifestyle and expectations in order to provide you with your perfect match. Contact Orthopedic Service Company or come visit our showroom so you can see for yourself if the scooter Pride Go-Go Sport is the vehicle for you.